This is the latest in our series of members stories featuring real-life experiences of members who turned to Best Doctors to ensure they had the right diagnosis and treatment. Best Doctors stopped Jack from undergoing an high-risk, unnecessary surgery. Bonnie’s dad, Jack, needed a heart valve replacement. However, he had a stroke due to a previous angiogram. Jack’s cardiologist said he would need to open a blockage in one of the carotid arteries before he would perform the heart valve replacement. However, Bonnie, her brothers and even most of Jack’s other doctors thought two procedures might be dangerous to his health. 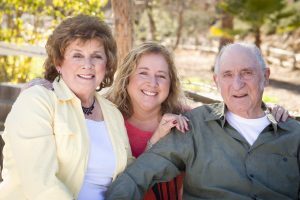 Around this time, Bonnie received a postcard from Best Doctors, a free medical advisory service provided through her employer at no cost to her, her dependents and her parents as well. She contacted Best Doctors right away to request a second opinion. Besides the Best Doctors clinical staff, a member experience coordinator guided Bonnie. She was “the angel on the other line,” Bonnie said. As Jack’s procedure was just around the corner, Bonnie wanted to get things done quickly. Her member experience coordinator “worked fast and furious.” She always let Bonnie know of any changes in the case, which allowed her to update her brothers and parents. “Nothing ever fell through the cracks,” she said. The lead physician on the case was available whenever Bonnie and her family needed questions answered. “He spent a crazy amount of time with us on the phone. He set up conference calls that were 45-60 minutes,” she explained. Once Best Doctors collected all of Jack’s medical records and information, the clinical staff sent them to an expert cardiologist for review. On Christmas Day, Best Doctors’ medical director personally sent Bonnie the comprehensive Best Doctors report, because Jack’s surgery was scheduled for two days later. In the report, the expert recommended against the additional procedure. “Because of the timing, everyone was so willing to work over the holidays, and that allowed us to sit down with our parents and have a conversation with them about their health,” Bonnie said. Jack decided against the additional surgery. After the surgery, at a check-in with his cardiologist, Jack was doing great. “In the end, it was so rewarding and my brothers and I are so happy that we could be advocates for our parents and help them make the right decision with all the necessary information. He was doing the right thing for the right reasons, and he felt confident he was getting the best care and doing the best thing for him. I truly believe the recommendation saved my dad’s life,” she said. “I don’t know how to put Best Doctors’ overall concern and sincerity of caring into words,” Bonnie said.